As the body ages, it slows production of elastin and collagen, causing wrinkles to appear and skin to sag. Radiofrequency is a non-invasive skin treatment that effectively reduces the appearance of fine lines and wrinkles. Until recently, treatments were only performed by licensed skin experts, but more affordable at-home options are now available. Judging from their reviews, radiofrequency machines are nothing short of spectacular: these high-tech devices allegedly produce immediately noticeable results, without the pain and recovery time associated with surgical rejuvenation treatments — and at a fraction of the cost. Should you invest in getting your very own machine? We investigated the effectiveness of at-home radiofrequency procedures and reviewed the best consumer devices on the market. What Can Radiofrequency Do for Your Skin? Radiofrequency (RF) procedures fall into the category of non-surgical skin tightening treatments, along with ultrasound and Intense Pulsed Light (IPL). These procedures all stimulate collagen and elastin production to improve skin tone and texture, minimizing the appearance wrinkles and “crepiness” in the process. Some treatments can even help reduce the appearance of cellulite by affecting fibrous tissue. Radiofrequency focuses energy on the skin’s epidermal layers (the top layer you actually see) to help make it appear firmer and smoother. Many people use it to tighten skin in the face and neck, but treatments can also be performed on other parts of the body, such as the stomach or thighs. It can take as little as 30 minutes to treat the face. The procedure is painless, although some users do report feeling heat from the machine during treatments, and mild redness or swelling shortly after. The procedure is also entirely non-invasive, which means that no downtime is required. Most treatments are safe for all skin types, although they may not be if combined with IPL. Between two and six sessions may be required to achieve optimal results. Significant differences gradually appear after a few months, and results can last up to one year. Maintenance procedures may be needed periodically thereafter to renew the effects. It’s important to note that skin tightening treatments don’t have much effect on advanced skin sagging, such as that which occurs after pregnancy or extreme weight loss. However, if you have mild to moderate wrinkles or loose skin, using a non-surgical skin tightening procedure such as RF can help significantly. Until recently, radiofrequency was only performed by licensed skin experts and cosmetic doctors. In the past few years a wide array of affordable, non-professional machines have hit the market, making it possible to treat yourself in the comfort of your own home. Generally speaking, these devices are not as powerful as those found in the doctor’s office. With at-home devices, multiple sessions will be needed to achieve the equivalent results of a few doctor’s appointments. However, at-home radiofrequency machines only cost between $30 and $1,000 USD, with most falling in the middle of that range. In-office procedures, on the other hand, often start at $1,000 and can go up to $5,000 USD or more, per course of treatments. A study published in the Journal of Drugs in Dermatology in late 2014 found that more than 90% of test subjects experienced wrinkle reduction and skin tightening after undergoing at-home treatments – as rated by three independent reviewers who were also board-certified dermatologists. In the study, participants used the NEWA Skin Care System for at least five treatments a week for one month. The independent reviewers assessed images taken one month before and after the treatment. They also conducted one- and three-month follow-ups with the patients. The NEWA Skin Care System went on to become the first device of its kind to be cleared by the FDA as an energy-based, at-home wrinkle reduction device. Various other studies have found that at-home RF machines can help reduce the appearance of crow’s feet, skin laxity around the eyebrows as well as other facial wrinkles and lines. In short, experts confirm that at-home RF treatments can be a convenient and cost-effective way to fight the signs of aging in the comfort of your own home. A quality at-home RF machine isn’t a small investment, so it’s important to choose the right one for your needs. We’ve done the homework and rounded up the four most popular modules here. This is the same system tested in many of the research studies mentioned above, and with good reason – It’s FDA-approved and developed by EndyMed Medical Ltd., a reputable medical technology company and a leader in RF energy treatment. EndyMed started out developing devices for professional markets and branched into the consumer market with the NEWA Skin Care System. The NEWA system uses the company’s patented 3DEEP technology to fight wrinkles and reduce sagging. You can even personalize your treatment plan with the NEWA mobile app, which will send you reminders so you never miss a treatment. This futuristic device houses the electrode dots that transmit the RF waves. Tripollar Stop is the facial version — a 12 to 15-minute session is recommended, two to three times a week over the course of six to eight weeks. Tripollar Pose is the larger version, designed for areas such as the stomach and thighs. It aims to reduce cellulite and give the skin a more toned appearance. Both devices employ similar RF technology to stimulate the production of elastin and collagen. 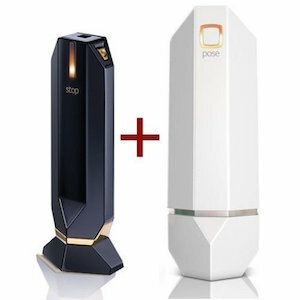 Rather than encasing the entire device in a single handheld shell like the other models listed here, the Dia Panda Box houses most of its inner workings in a separate plastic body you can leave on the bathroom counter. The actual wand is small, light and easy to hold. Overall, the design resembles that of the larger professional versions found in doctors’ offices. The probe comes with two surface attachments – a narrow one for your face, and a wide one for your body. 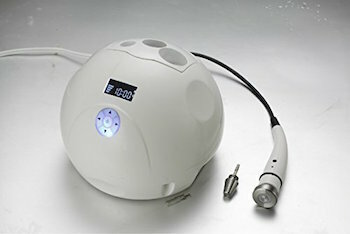 This device also features six intensity levels so you can customize your treatments. This device combines radiofrequency waves with red and yellow light, which works in tandem to increase skin elasticity, close pores, firm the skin and brighten dark spots. The device has an LCD screen to display the setting you’re on and how long the treatment has been running. It’s not battery-powered and has to be plugged in for use. The contained and compact design – it only weighs about 1.5 pounds – makes it easy to pack if you need to travel.